Here's what hasn't changed under the revised House Republican health care bill to repeal and replace Obamacare: The rich would still get tax cuts and other tax breaks. That's because the legislation, which narrowly passed the House Thursday, would still repeal the tax hikes imposed by Obamacare on high-income households. They were intended to help fund insurance subsidies and other provisions. The bill also would expand the contribution limits for certain tax-advantaged accounts. There are no official public estimates of the revised bill's cost nor how it would change the bottom line for different income groups. But the story is likely to be similar to that under the original bill, said Gordon Mermin, senior research associate at the Tax Policy Center. That is, the wealthy are likely to see tax savings, while the lowest income households are likely to see benefit cuts. Eliminate the Medicare surtax on wages: High-income earners currently pay the 1.45% Medicare payroll tax on wages up to $200,000 ($250,000 if married). But then they pay an additional 0.9 percentage points -- or 2.35% - on wages above those levels. Under the House bill, that 0.9 percentage point surcharge goes away in 2023 -- a delay from the original legislation, which would have nixed it in 2018. 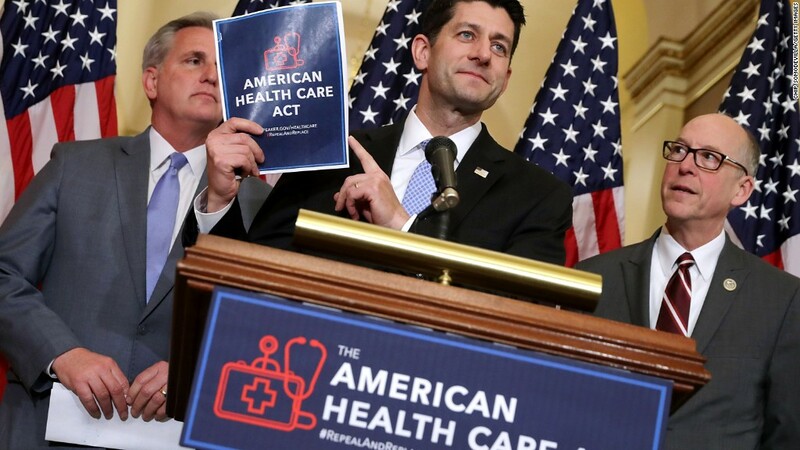 The enactment date was pushed back to free up some money to augment tax credits for Americans in their 50s and early 60s, who would face much higher premium costs under the GOP bill, since it would let insurers charge older consumers more than they can under Obamacare. Get rid of the Medicare tax on investments: In addition to the surtax on wages, high-income earners making more than $200,000 ($250,000 if married filing jointly) are subject to a 3.8% Medicare tax on a portion of their investment income, which is determined by formula. Investment income includes money from capital gains, dividends, interest, rental income and annuities. The revised House bill would eliminate this so-called net investment income tax in 2017. Create more generous tax-advantaged accounts for health expenses: Today, individuals can save up to $3,400 and families can save up to $6,750 tax free in a Health Savings Account. Under the bill, those limits would nearly double, to $6,550 for individuals and $13,100 for families in 2018. The bill would also eliminate the caps on contributions to tax-deductible flexible spending accounts. Right now, employed individuals may each save up to $2,600 a year, so a two-earner couple may save $5,200 combined. Raising the contribution limits on tax-advantaged accounts disproportionately benefits the highest-income households, because they're in the best position to sock away more money. The bill would also end the Obamacare prohibition on paying for over-the-counter medications with funds from tax-advantaged accounts, such as HSAs and flexible spending accounts. And it reduces the penalty from 20% to 10% if funds from an HSA are used for non-medical purposes. These provisions would begin in 2018. Raise the income limit on who gets help paying for insurance: Anyone who earns less than $47,500 today is eligible for a tax credit to help pay their health insurance premiums if they buy a policy on the insurance exchange. The House GOP bill will make it easier for many more people in the middle class as well as those earning into the six figures to benefit as well. Anyone making up to $215,000 ($290,000 if married) would qualify for at least some portion of a credit when buying insurance on the open market.